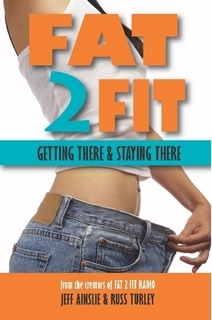 Fat 2 Fit: Getting There And Staying There is the book which places every effective bit of information and advice about weight loss in one place. The Fat 2 Fit program, which was explained in detail over 100 episodes and three years of the Fat 2 Fit Radio podcast, is now compiled into a single and powerful reference book. This is the weight loss and fitness manual you have been waiting for. If you want to lose 15 pounds by next week, this is not the book for you. If you want to be strong, lean and healthy for the rest of your life without crazy starvation diet plans and insane workout schedules, this book is for you. If you truly want a better body and never want to go back to the old unhealthy version of yourself, the keys to your success are all here. The no-nonsense, no-hype, science-based weight loss philosophy discussed in this book has had a huge impact on my attitude and motivation (and success) at shedding some excess fat. Fat loss takes patience, which I never fully appreciated until adopting their approach. It was such an easy read and made me realize how crazy some “common knowledge” really is! I recommend this to anyone looking to improve their fitness!